To gain insight into nurses' suicide awareness and prevention training, their confidence in engaging in conversations about suicide, and the barriers and enablers affecting their engagement and future training in this area. An electronic survey was carried out with members of the Royal College of Nursing (RCN). A total of 415 RCN members responded to the survey. The survey included qualitative and quantitative questions about barriers to engaging in conversations about suicide, and nurses' suicide awareness and prevention training needs. A thematic analysis was undertaken to identify the main themes. Respondents identified several barriers to engaging in conversations about suicide, including: lack of time and resources; lack of skills, training and knowledge; insufficient service provision; and stigma. 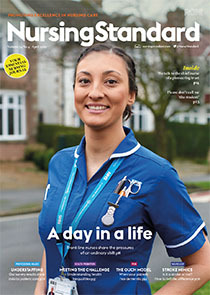 A range of suicide awareness and prevention training needs were identified, such as pre and post-registration training to increase nurses' knowledge and skills, regular updates of evidence-based approaches, structured supervision and debriefs. It is important for issues related to suicide to be addressed in all fields of nursing, and to be included in the pre-registration nurse education curriculum. Staff should be supported in developing the skills they already have and using their interactions with others to improve their confidence in undertaking conversations about suicide.